To increase educational attainment to 60%, many more students must be served in new and different ways. Traditional delivery systems simply can’t be “scaled up” cost-effectively to meet the growing demand. And if these traditional delivery systems are insufficient, so, too, are the institutional business and financial models that are based on those approaches. What’s needed, then, are new and more productive business models – models that are specifically geared to mesh with these new, lower-cost modes of academic delivery. These new models must be supported by public finance and regulatory policies that create incentives and remove barriers to change. 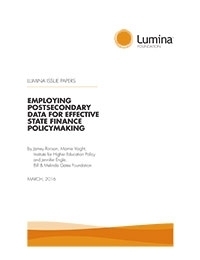 Lumina seeks to create these new models and to encourage their wider acceptance and use among policymakers and institutional leaders. We have helped develop such models – performance-based models for states, systems and institutions. These new models include strong incentives for affordability and completion; for increasing attainment among underrepresented students; for expanding capacity to deliver high-quality, low-cost programs; for reducing time-to-degree; for addressing specific workforce needs; and for improving productivity. The models also emphasize competency-based education and the important trend of awarding credit for learning obtained outside the classroom. Efforts to encourage adoption of these and similar models are ongoing. This work is led by Lumina Strategy Director Kevin Corcoran. 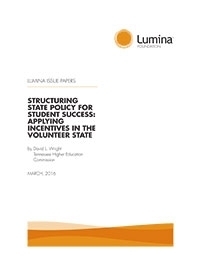 Lumina Foundation and the Bill & Melinda Gates Foundation co-hosted a convening on April 7 and 8, 2015, in Washington, D.C., to help 15 interested colleges and universities that met specific readiness criteria gain a better understanding of the U.S. Department of Education’s1 Competency-Based Experiment part of the Experimental Sites2 Initiative (ESI). 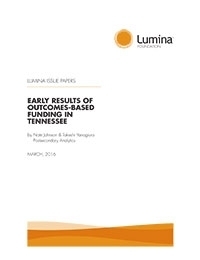 No state has done more than Tennessee to shift state higher education funding to reflect outcomes rather than inputs. In other states, most of the core funding for higher education, including tuition and state appropriations, flows to colleges based on student enrollment.